For those who want a casual style and the comfort of elevator sneakers even in Winter, GuidoMaggi created the new "Bergen". 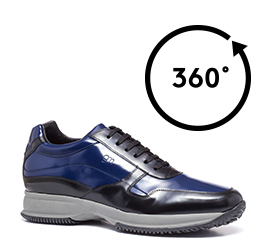 Handmade in Italy, are characterized by the particular double colored upper in full grain leather: shiny navy blue and shiny black. A combination that gives elegance and uniqueness in style. The linner lining in soft goatskin, also allows maximum comfort. The insole made of genuine Italian leather, the gray outsole is super light with anti-slip rubber of the latest generation. The inner height increaser can be chosen between 2.4, 2.7, 3.1 or 3.9 inches. A design all made in Italy that will follow you in your winter days and increase your self-confidence.